And we’re thrilled! Now is the time to tackle the serious (and worsening) issues with service delivery at the Ministry of Social Development and Poverty Reduction, and raise BC’s shamefully low social assistance rates. Congratulations on your appointment as Minister of Social Development and Poverty Reduction. We are thrilled about your strong mandate to improve life for people on welfare and reduce poverty in British Columbia. We are writing to you to set out some longstanding and worsening problems that low income people have when trying to access income assistance through the Ministry of Social Development and Poverty Reduction (“MSDPR”), and also to propose a number of solutions to these problems. 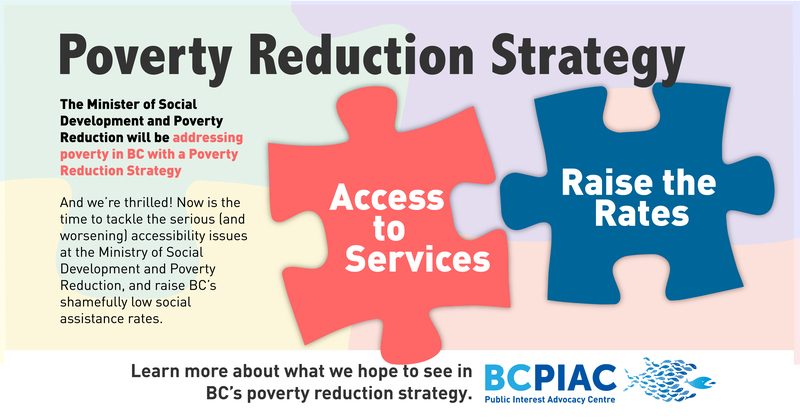 BC Public Interest Advocacy Centre (“BCPIAC”) is mandated to address systemic issues affecting low income people across the province. Based on consultations with members of the anti-poverty community, we have recently focused our efforts on improving accessibility at your ministry. We are concerned that there is a growing number of British Columbians who are in need of income assistance and disability assistance (often collectively called “welfare”), and are in fact legally eligible for it, but are struggling to survive without it simply because they cannot navigate the welfare system. As you know, over the past several years, the recently renamed MSDPR has transitioned from delivering services primarily in person to delivering services primarily through an online portal and over a centralized 1-866 phone line. Wait times on the phone line are extremely long – regularly averaging over 45 minutes – and workers are pressured to keep calls within short, arbitrary time limits whether or not the caller’s issue is resolved. Meanwhile, there have been massive reductions in in-person services, including office closures across the province and removal of discretion for frontline workers. Increasingly, those who go into a Ministry office for help are told to leave and use the online portal or phone line instead. This is the case despite the fact that the Assistant Deputy Minister of Service Delivery has repeatedly told advocates that people who require in-person service can go to the front desk of an MSDPR office for intake. Ability to effectively communicate and receive information online and over the phone, through a call centre. In its policy manual, MSDPR recognizes that it has a duty to accommodate its clients, and states that it will accommodate individuals who require in-person services. However, members of the anti-poverty community report to us that in practice, MSDPR rarely provides in-person services to individuals who require them. Instead, it has become common practice in MSDPR offices for staff to refer those that need help navigating MSDPR services to community organizations. The reality to which MSDPR must answer is that many, if not most, welfare applicants and recipients require in-person services as a matter of accommodation. Further, those individuals with the highest accessibility needs also tend to be the most entrenched in poverty, meaning that when they are denied access to welfare, they must survive on little to no money. We (and many others) have repeatedly raised these problems, and a solution is long overdue. In a systemic complaint to the BC Ombudsperson in May 2015 filed on behalf of nine community organizations across the province, we described these problems in detail, and provided a large body of evidence to demonstrate how MSDPR’s service delivery model is effectively shutting vulnerable people out. A copy of that complaint is attached to this letter as Appendix A. We also made submissions about these issues to the Select Standing Committee on Finance and Government Services in 2015 and 2016; our submission from October 2016 is attached to this letter as Appendix B. Despite our work and the vocal opposition to MSDPR’s service delivery changes by those who regularly interact with the welfare system, MSDPR has continued to forge ahead with its move to an increasingly complex, impersonal, and tech-based model of service delivery. In the meantime, vulnerable people are left without critical supports simply because they cannot navigate the bureaucratic labyrinth. Create a BCelD username and password. Since its introduction in February, the latest version of the application process has prompted a flood of calls and emails to our office from advocates and individuals confounded by these new requirements. While MSDPR says that it provides remote-based phone support to applicants who require accommodation in completing the online application, this does not respond to the anti-poverty community’s concerns about the online application. First, asking applicants to complete the application over the phone raises many of the same accessibility issues as asking them to complete the application online. It does not at all accommodate applicants who require in-person assistance in order to complete the application. Second, members of the anti-poverty community report to us that in practice, MSDPR refuses to provide phone support to those who request it. In May 2017, BCPIAC sent an open letter to all candidates in the provincial election outlining the issues with the new online application process, and calling for candidates to commit to addressing them; that letter is attached here as Appendix C.
We are so pleased to have a new government that has committed to creating a province “where no one is left behind.” In service of that commitment, we ask that you take steps immediately to ensure that the most vulnerable people in the province can access the supports they need – supports to which they are legally entitled. Implement accountability and performance measures based on that review. We would welcome the opportunity to discuss this letter with you further. We would also be very pleased to work with you in a collaborative manner to improve access to MSDPR services.